Applebee's understands your love of $1 drinks. In recent months, the bar and grill has rolled out $1 deals for margaritas and Long Island ice teas to the delight of many. It's happening again starting today. They're calling the special the Dollarmama. For people who refuse to utter that portmanteau in public, it's a Bahama Mama. Like its predecessors, it's going to cost you just $1 throughout the entire month of February. The drink is made with white rum and "Applebee's new, proprietary mix of pineapple, lime, and orange juices with hints of coconut and cherry." It sounds like it's about four months too early for this drink, but if you close your eyes and get the drink before the buffalo wings hit the table, you can pretend you're somewhere swell. 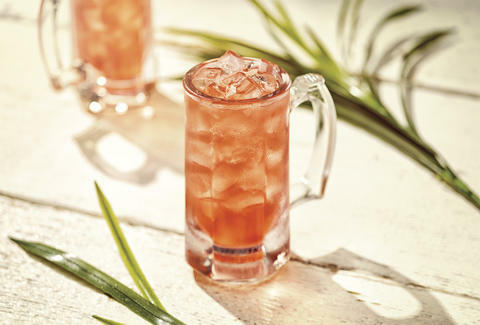 “We’re proud to introduce our own unique twist on the popular Bahama Mama drink to our guests,” said Patrick Kirk, vice president of beverage innovation at Applebee’s. Dollar cocktails are a good way to get your grandpa to shut up about how cheap things were in his day. At least until your burgers lands at the table. Oh, Grandpa!